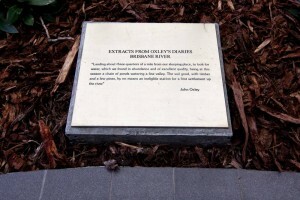 John Oxley Centre Fail | There once was a creek . 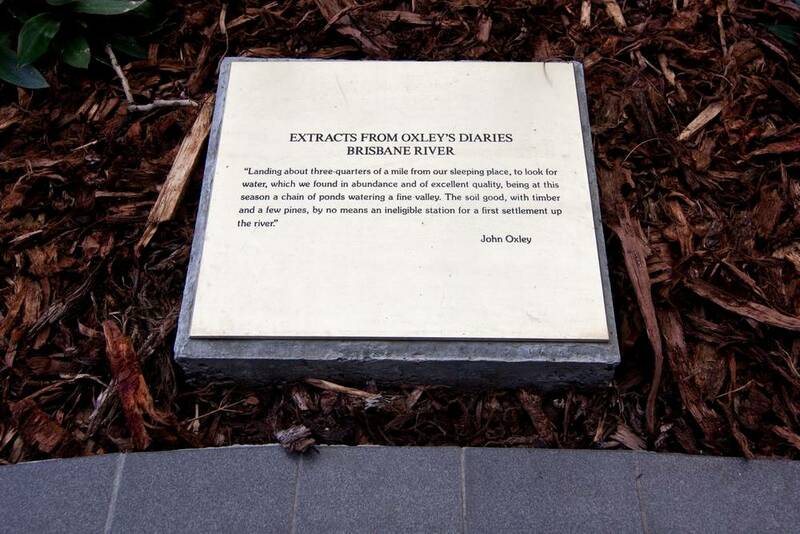 . .
A plaque in the old courtyard of the John Oxley Centre, comemmorating Oxley’s landing at Western Creek. Back in April 2012 I posted about the renovations of the big courtyard in between the two office towers of the John Oxley Centre on Coronation Drive. This courtyard sits more or less on top of the old stream of Western Creek (now Milton Drain) just before it met the river. It is quite likely where John Oxley came ashore in 1824 to look for fresh water, which he found in abundance somewhere along Western Creek. In the gardens of the old courtyard there were plaques engraved with excerpts of John Oxley’s diary describing his landing here in 1824. I wondered if these might somehow survive the renovations, or if some other homage to Oxley’s landing might replace them. The two ‘signposts’ at the entrance to the newly renovated John Oxley Centre. Last weekend I finally got around to seeing how it has all turned out. The whole space has been given a facelift to give it a more ‘modern’ look and feel. (To my mind it was hardly worth it, but hey, that’s not my call to make.) The plaques are gone, but Oxley’s landing has not been forgotten. Unfortunately though, the effort to commemorate it could hardly be described as successful. 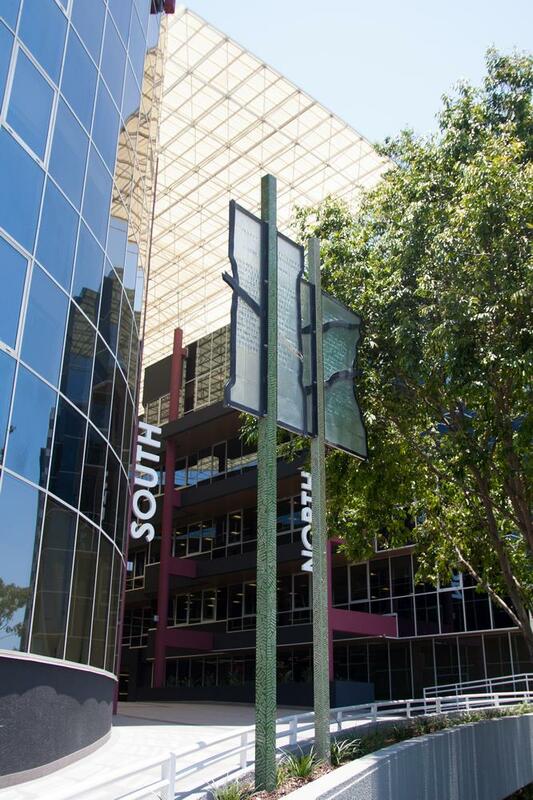 As you approach the courtyard from Coronation Drive, you might notice these two oddly shaped steel plates affixed to two intricately marked square poles. Or more accurately, there are four plates, each fixed to opposite sides of the poles to give the impression of two distinct shapes. What are they meant to be? Flags? Signposts? There is black trimming running around the outline of the plates, and also diagonally across them. On one of the plates, half of the diagonal line already appears to have fallen off, leaving a smear of glue. Is this supposed to be the outline of the river? The creek, perhaps? The two … erm, ‘pages’ on the posts outside the John Oxley Centre. Eventually it culminates at the famous reference to a “FIRST SETTLEME…P THE RIVER”. I knew what I was looking for. I visited the place with the specific aim of seeing how Oxley’s diary had been reflected in the new courtyard. I only noticed these posts because I was looking for something, and I only noticed that there was writing on them because I was looking for that too. And had I not already been familiar with this particular diary entry, I wouldn’t have had the foggiest idea what the words were trying to say, or where they came from. So much for the skinny post. What about the fat one with the river running across it? I don’t even know. Even by zooming in on my photo I can only read half of it. Maybe it’s another page from Oxley’s diary. Or maybe it’s from another document describing the area. As far as I could tell, there was nothing to provide an explanation (perhaps I just didn’t look hard enough). I honestly can’t view this installation as anything other than a dismal failure. It accomplishes virtually nothing, except to cause confusion to anyone who happens to notice it in the first place. If someone unfamiliar with the story of Oxley’s landing can look at it and deduce something about the history of this site, and the reason for the building’s name, then I take my hat off to them. 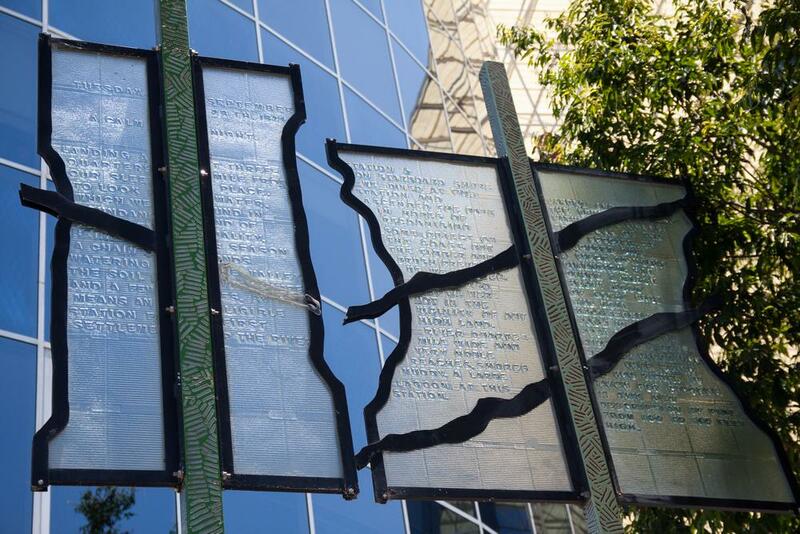 This entry was posted in Short articles and tagged john oxley, public installations by angusv. Bookmark the permalink.